Heard that word in the office lately? It’s quite a word. To younger males, it conveys a thousand meanings. “Bro” uttered with enthusiasm expresses joy. While a bit goofy, the word illustrates another strong trait Millennials have exhibited in the workplace: a desire to connect with coworkers and supervisors on a personal level. It’s a trait related to their need for a workplace that resembles the other 16 hours of their lives, with low pressure, personal independence, and free flow of ideas across brains. Think about how corporate culture has been portrayed in movies and television consumed by this generation. "Greed is good", the Devil Wears Prada and endless TPS reports - in short, bosses are expected to be difficult. The need for a reasonable manager isn't just exclusive to Millennials, however. There is growing evidence that executives and managers are as responsible for employee happiness as any other factor. People don't quit jobs, they quit managers. It's a classic business adage, but statistics have borne it out. Relationships with superiors are critical, but to a Millennial, the supporting cast is just as (or perhaps more) important. Essentially, what Millennials are looking for is a comfortable environment. Their jobs are hard enough; they don't want to constantly battle coworkers as well. 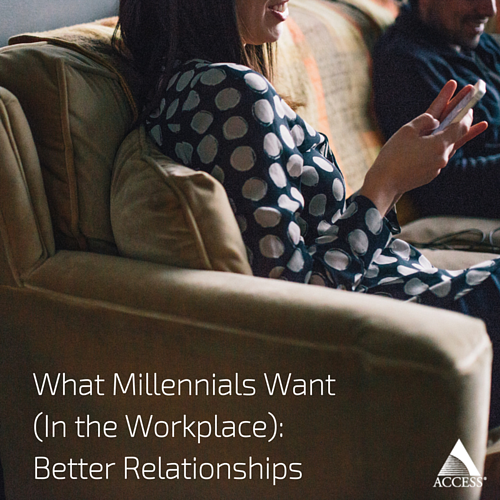 Relationships can make or break employee success in an office, regardless of generation. It's intensified with Millennials, a generation concerned with causes and having an impact. 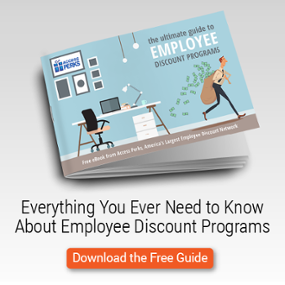 The reality is an employee's job is only a fraction of their office experience. Their environment is just as important, along with salary and corporate perks. Hire personality, develop ability. Say you have two candidates - one who's amazing at their particular skill but not a fit in the company culture, or someone who would fit perfectly but isn't quite as proficient. If corporate culture is important, the second person gets the job. Their professional skills can be developed, whereas a cultural misfit can affect the performance of coworkers and potentially alienate customers. Be flexible. Assuming employees are doing their jobs well and completing tasks on time, treat them as adults and let them chit chat next to the cooler, or take a long lunch with coworkers. Be inclusive. It's fine to be friends with employees, but the onus is on the manager to prevent cliques. Nothing will poison an office culture quicker than an "inner circle" - especially if the manager is in the clique. Focus on people, not finances. Companies that build their goals around customer satisfaction - and not financial gains - are much more likely to have higher employee engagement (not to mention happier customers). Placing an emphasis on money leads to mercenary thinking among employees - the type of thinking that causes individuals to dial in primarily on their own personal gain. Never lose sight of productivity. It kind of goes without saying to always emphasize performance and service. The bigger key here is to build a team's camaraderie around achievement. Celebrate great accomplishments and utilize the success of one to lift the overall unit. Think of sports: nothing helps a team's chemistry like winning together. Enabling relationships in a corporate setting is a delicate balance. Too much emphasis on relationships can hurt productivity. Too much emphasis on simply working can cause employees to feel like soulless cogs and disengage. But by focusing on a culture of high achievement and hiring the right people, a company's culture can become a major asset that attracts and retains Millennial employees - and every other generation out there, bro.